It is indicative of a long-overdue onset of realism in Washington that the U.S. decided not to inform the government in Islamabad of the raid until after it happened. White House’s John Brennan openly admitted there had been concern that Pakistani forces would deploy to counter the US team conducting the operation. He also stated the obvious: that it was “inconceivable that Bin Laden did not have a support system” in Pakistan. Brennan could have added that on far too many occasions critical intelligence the U.S. shared with the Pakistani authorities has been passed on to those who should be the last to know, including a timely tip on the pending cruise missile attack on OBL’s camp in Afghanistan in 1998. Bin Laden’s last whereabouts neatly encapsulate suspicions about a nation whose institutions have become steadily more religiously charged since its birth as a Muslim majority state out of British India in 1947. They reinforce the view articulated last year by David Cameron, UK prime minister, that Pakistan looks “two ways” over terror. But worse, they suggest that as in Afghanistan before 2001, militants are dangerously close to the institutions of power and reside in the heart of the country rather than just on its wild mountainous fringes. Pakistan is an enormous Jihadi campus in which some ten thousand madrassas prepare over one million students for the Holy War… It can hardly be otherwise in a country founded on the pillars of Islamic orthodoxy. [It is] the worst violator of the ban on nuclear proliferation, thanks to the work of Abdul Qadeer Khan, the architect of Pakistan’s nuclear program. … He felt that giving nuclear technology to a Muslim country was not a crime. The sentiment is shared by Pakistan’s elite… as befits the first modern state to be established on openly Islamic principles. Counterinsurgency in Afghanistan, funded by the Pentagon, merely confirms what Chronicles readers have known for years: that the regime in Islamabad is unwilling and unable to act in any manner inconsistent with its Islamic roots and ethos… If we look at the growing list of terrorist attacks and foiled plots in North America and Western Europe, it is evident that plots stemming from the Afghanistan-Pakistan border region are the single most important threat to Western security… The long list of Pakistan’s proven or suspected links with numerous terrorist attacks in recent years – and notably the 7/7 bombings in London in 2005 – illustrate the ambivalent role of Pakistan in the “War on Terrorism.” The ability of the establishment in Islamabad to run with the hare and hunt with the hounds has been an affront to all enemies of jihad for years. Not only Taliban but most other Islamic extremist and terrorist movements all over the world were born out of ideas conceived in the battlefields of Afghanistan and subsequently matured and spread from Pakistan’s political, military, and religious establishment. These movements enjoyed the support of the Pakistani military-intelligence structures, and most notably its powerful Inter-Service Intelligence Agency (ISI), a leading promoter of state-sponsored terrorism. It grew rich and mighty, thanks to the U.S. role in helping Islamic fundamentalists fight the Soviets in the 1980s. Some 6 million Baluch were forcibly incorporated into Pakistan when it was created in 1947. This is the fourth insurgency they have fought to protest against economic and political discrimination. 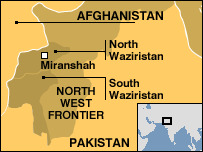 In the most bitter insurgency, from 1973 to 1977, some 80,000 Pakistani troops and 55,000 Baluch were involved in the fighting. Most of Pakistan’s natural resources are in Baluchistan, including natural gas, uranium, copper and potentially rich oil reserves, yet Baluchistan remains the most impoverished area of the country. The natives are bitter. Steady and reliable foreign help would do wonders for the separatist movement. In neighboring Sindh, nationalists who share Baluch opposition to the Punjabi-dominated military and political elite are reviving their long-dormant dream of a sovereign Sindhi state, or a Sindhi-Baluch union that would stretch along the Arabian Sea from Iran to the Indian border. The assassination of Benazir Bhutto – a native of Sindh – was widely blamed on the Punjabi establishment, with Sindhi nationalists complaining the Punjabi elites treat the province as occupied territory. Benazir Bhutto was not the first to die in Punjab: her father Ali was hanged by General Zia ul-Haq – a Punjabi – in 1979. Sindh has the potential to contribute to the prediction that Pakistan may splinter apart within ten years. The Pashtuns, South and North Waziris and other restive groups in Pakistan’s permanently volatile Federally Administered Tribal Areas will be less willing to support Islamic militants if their nationalist grievances are recognized and supported. The model exists in Iraq’s Sunni “triangle,” where the marriage of convenience between Sunni Arab nationalists and Islamic extremists was broken when the U.S. accepted that no Shia police or military should lord over Sunni areas. A promise to the elders of each tribal group in Pakistan of complete self-rule – up to and including sovereign statehood – and the tangible means of achieving it and a few million in cash here and there, to sweeten the deal, would quickly end their association with the religious extremists and make one-fifth of Pakistan ungovernable to the Punjabi elite. The possibilities are enormous, I concluded two and a half years ago and reiterate now. They should be explored and exploited creatively. India should be helped to provide to Baluch, Sindhi, and assorted tribal separatists the same kind of support that Islamabad has been giving to Kashmiri militants for decades. President Mohammad Karzai should do the same from Afghanistan, and he might be happy to comply. After all, irreversible removal of the Pakistani state so stubbornly supportive of his Taliban foes may be a precondition of his own survival. On balance, the removal of Bin Laden should prompt Washington to become a lot less indulgent of this nuclear-armed state so used to running with hares and hunting with hounds. If Pakistan is carefully degraded from within, the nuclear arsenal bequeathed by Dr. Khan becomes irrelevant. It should be taken out, of course, but in any event when Pakistan starts imploding its generals will not be tempted to use the bomb any more than Soviet generals were tempted to do so in 1990-1991. They will withdraw into their Punjabi redoubt instead, where they will have only their own people to terrorize and exploit… until they are killed by the insurgent mob or forced into Saudi exile. A pleasing prospect.